This year’s Festival  enjoyed another year of growth, doubling its ticket sales since launching in 2010, proving once more that there is a real demand for quality live magic in the UK. A newly introduced ‘Gala Preview’ at The Royal Lyceum Theatre opened the Festival followed by the ‘Opening Night Magic and Variety Gala’ attended by Cabinet Secretary for Culture and External Affairs, Fiona Hyslop. 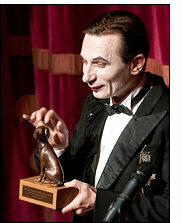 The sell-out Gala show saw performances from Voronin (Ukraine. photo), Les Chapeaux Blancs (France), Jeton (Germany), Drew McAdam (Scotland), Pierre Xamin (France) and Vox Motus (Scotland). The hugely anticipated sell-out ‘Four Nations Magic-Off’ closed the Festival, at its new venue ‘Traverse Bar Cafe’, with the UK’s top comedy magicians fighting it out to be crowned the winner. Organisers were proud to bring the UK premier of Voyageurs Egarés to the Capital. One of this year’s success stories, the production, by two award winning French Magicians Jérôme Helfenstein and Claude Brun, was an hour long fun magic play packed full of illusions, circus skills, video technology and shadow arts… there's been nothing else quite like it in any of the MagicFest programmes. Close-up Magic proved a popular genre this year with 2 shows selling out for the full 7 day run. The sell-out Street Magic Master Class and 5-Day Magic School once again proved such a hit with the kids of Edinburgh that next year organisers are planning to expand the Master Classes. The prestigious sleight of hand competition ‘War of the Wizards’ attracted competitors from all over the world and was hotly contested. Beating of stiff competition to win a year’s mentoring by MagicFest Artist Director Kevin McMahon, the under 18 winner, Adam Black from Dunblane, first started to learn magic after seeing Kevin performing at Stirling Castle four years ago. The over 18 winner, Australian magician Tony Roberts, said; “The competition was a great experience, I am proud to win and really looking forward to being a part of the Festival next year." MagicFest Artistic Director, Kevin McMahon says; “All Festival shows had successful runs and received great reviews and audience feedback. We are very pleased that all the new formats we tried this year including 5-Day Magic School, Street Magic Master Class and the Gala Preview worked out really well and we’re excited about bringing them back next year along with some other innovative events.